Autism is a neuropsychological disorder that is characterized by impaired communication, social interaction, as well as restricted and repetitive behavior. Most parents usually note signs of autism in the first two years of their children’s life (Le Breton, 2010). These signs usually develop gradually, but some children suffering from autism usually reach the usual developmental milestones at a relatively normal pace then start regressing. Autism is characterized by particular set of behaviors and is also a spectrum disorder. This means that autism affects individuals differently and with varying degrees and intensity. As such, while all people with this disorder share some difficulties, their condition affects them in different ways. Some behaviors associated with autism include difficulty in holding a conversation or making eye contact, delayed learning of language, difficulty with executive functioning that relates to planning and reasoning, narrow and intense interests, poor sensory sensitivities, as well as poor motor skills (Dawson, 2011). Again, an individual on the spectrum of this disorder might follow most of these behaviors or just a few of them, or many others besides. 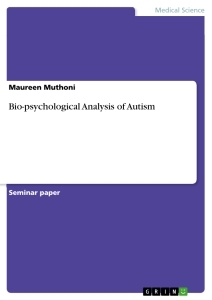 This paper critically analyses autism including its causes, pathology, treatment options, as well as the diagnostic and technologies that are employed in clinical diagnosis, care, and basic science research of this order. Long before autism was named, a few examples of autistic symptoms, signs and treatments had already been described. For instance, Martin Luther’s Table Talk tell a story of a twelve year old boy who was showing signs of severe autism. However. The earliest case of autism that is well-documented is that of Blair Hugh of Borgue, which is put together in a 1747 court case. Blair’s brother petitioned to annul his marriage so as to gain Blair’s inheritance. His petition is said to have been successful. Another historical example of autism is shown by a feral child who was caught in 1798 showing significant signs of the disorder (Dawson, 2011). However, the feral child was lucky since he was treated by Jean Itard who was a medical student. Itard treated him using a behavioral program that was designed to help the feral child form social attachments, as well as induce speech through imitations. It was not until the year 1938 that the word autism took its modern sense. This happened when Hans Asperger, a lecturer at the Vienna University Hospital, used the terminology during a lecture about child psychology in German. At the time, Asperger was trying to investigate a particular Autism Spectrum Disorder, which is today known as sperger syndrome. In English, the term autism was first used in its modern sense by Leo Kanner who was responsible for introducing early infantile autism in the year 1943. Kanner’s report highlighted eleven children who had behavioral similarities. Most of those characteristics described in that report are still considered typical for autism spectrum disorders. In the beginning of the late 1960s, this disorder was established separately from other syndromes by demonstrating that autism is lifelong. These characteristics typical of autism distinguished it from schizophrenia, intellectual disability, and other developmental disorders. It is around the same time that clinicians and therapists started demonstrating the benefits of involving both the parents and their autistic children in active programs of therapy. As the mid and late 1970s fast approached, evidence of genetic role in pathology of autism was still scattered. Currently, autism is considered as one of the most heritable among all psychiatric conditions. My decision to tackle this particular disorder is influenced by the fact that my two year son is autistic. Therefore, I have personal experience in handling children who have autism. Again, I feel that I need more enlightenment on this disorder so that I can gain knowledge on how best to help and handle my son, as well as support him. Last year, the Center for Diseases Control and Prevention issued a report suggesting that the prevalence of autism had increased to 1 in 68 births in the U.S alone, and 1 in 54 boys in the country. Worldwide, the rate of autism prevalence is approximated to be about one to two in every one thousand people. In addition, autism occurs 4-5 times more in boys than it does in girls (Center for Diseases and Control (CDC) , 2014 ). Diagnosis of autism is based on behavior of an individual, not on the mechanism or the cause since it is a spectrum disorder and its symptoms affect individuals differently. In the DSM-IV-TR, autism is defined as exhibiting about six symptoms that include at least two in impairment of social interaction, difficulties in communication, as well as another one in restricted and repetitive behavior (Dawson, 2011). This disorder is highly variable that first appears during childhood or infancy. Generally, autism follows a steady course lacking remission. Overt symptoms of autism gradually begin their manifestation after the six months of age. Later, these symptoms become established by the time the child turns two or three years, tending to continue through the person’s adulthood, although in a more muted form. Autism is not distinguished by just by a single symptom. Instead, it is characterized by a triad of symptoms including impairments in communication, social interaction, as well as repetitive behavior and restricted interests (Akshoonoff & Pierce , 2012 ). Other aspects of autism such as atypical eating habits might be common among autistic individuals but they are not essential symptoms for diagnosis. Individual symptoms for autism occur mostly in the general population and seem not to associate greatly, but of course without a distinct line separating the common traits from those that are pathologically severe. Individuals with this disorder often show social impairments and usually lack the intuition regarding others, which many people free of autism take for granted. Such unusual social developments start becoming apparent early on in childhood. Children with autism often show diminished attention to social stimuli (Ayres , 2013). In addition, such children smile and look at other people less often. In the same breath, autistic children respond less to their name. Autistic toddlers have less turn taking and eye contact, and they lack the ability to use the simplest of movements to express themselves, pointing at things, for example. Autistic children are less likely to show social understanding, ape and respond to emotions, approach other people spontaneously, take turns with others, and communicate non-verbally (Clifford & Gevers , 2012). However, these children form strong attachment bonds with their care givers. Contrary to popular belief that most autistic children prefer to be alone, researchers opine that these children suffer from frequent and more intense loneliness than their non-autistic peers. Most autistic individuals fail to develop enough natural speech that is required to meet their communication needs (Clifford & Gevers , 2012). Difficulties in communication may be evident from the first year of life in autistic children. Such difficulties include unusual gestures, delayed onset of babbling, unsynchronized vocal patterns, and diminished responsiveness to the world around them. As they grow up, these children are less likely to share experiences, have less diverse and frequent babbling, master word and word combinations, as well as consonants. Such children are also less likely to repeat others words, and they have their gestures less integrated with words. Autistic children often encounter difficulties in developing symbols into language and in imaginative play (Dawson, 2011). Bio-fuels. Is Ethanol the answer to America’s fossil fuel petroleum energy crisis?